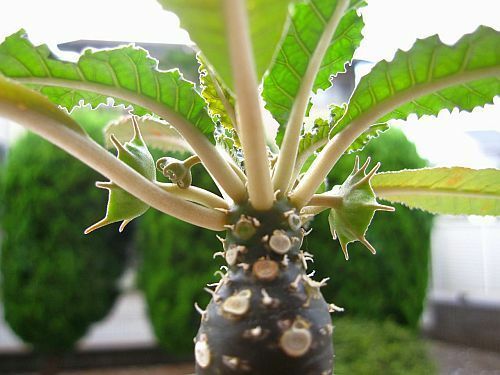 ﻿Dorstenia contrajeva or Contra Heirba, is native to the tropical Caribbean with strange looking receptacles. The leaves are 10 cm long and wide and deeply pinnately lobed. ﻿There is no pre-treatment of the seeds required. The seeds are sown in mineral-based cat litter (no clumping litter) or perlite (germ-free) in plastic-pots. Please sow the seeds on the mineral soil. Bigger seeds need to be covered with the mineral soil, small seeds should remain on the surface. Location: on the windowsill or in a small greenhouse in partial shade, daytime temperatures at about 73-83 F, somewhat lower at night at 68-72 F. The resulting micro-climate provides ideal conditions for germination.